How do I schedule a shift? It’s as simple as clicking on the Create shift button or clicking on the + sign that appears when you hover your mouse over a spot in the calendar. 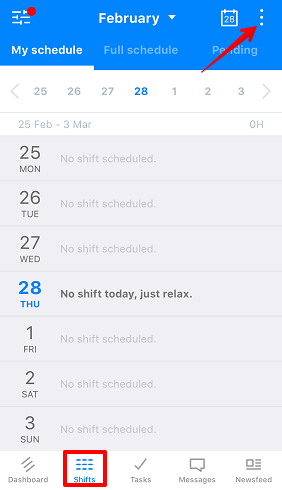 If you click a spot on the calendar within an employee's row, it will add that employee's name to the shift. If you click in the unassigned row, the shift can be left as unassigned or you can add an employee's name. Clicking in the available row creates an available shift. 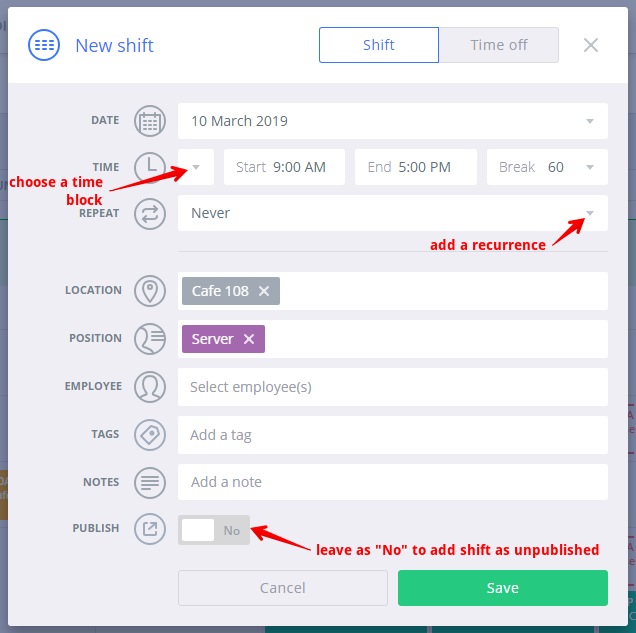 In the window that appears, you can enter a start and end time or select a time block, choose whether the shift is recurring (note that it's not possible to add a recurrence for available shifts), add a break duration, and assign the location and position. You must enter at least a location and position to be able to save the shift. An employee can be assigned at a later time. There are also options to add a Tag (Business version) and notes. When you're ready to Save your shift, you can also choose whether to add it to the schedule as an unpublished shift or as a published shift. Just switch the toggle shown above to choose one or the other. Unpublished shifts are only visible to managers and admins. This means you can save the shift and make edits to it multiple times without alerting your employees. Published shifts are visible to all users (depending on your visibility settings), so you may want to wait to publish the full schedule once all your additions and edits have been made. 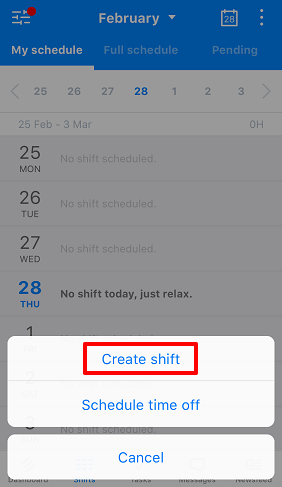 To schedule a shift from the app, go to the Shifts tab and then tap the options button (3 dots) at the top right of the screen. On the next screen, you can enter all the shift details. 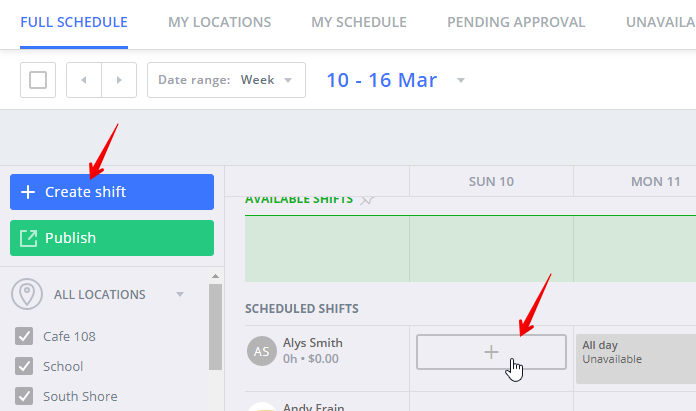 You can apply time blocks, add a break duration, hide the end time, make the shift recurring, add tags, make it available or unassigned (just leave the employee field blank for an available or unassigned shift), and add notes.